The VAMC Surgeon's Quarters Open House is a Success! The Fort Boise Surgeon's Quarters Restoration/Rehabilitation is complete and the building will stand for another 100 years! Over 200 people attended the Open House on Saturday, August 5th. 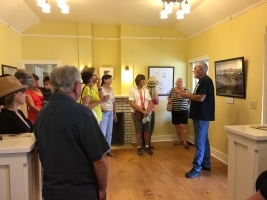 They toured the building and heard about the history of the building and the rehabilitation work from project leader John Bertram. Preservation Idaho partnered with VAMC Administration and, led by John, gathered funds, construction material, craftsmen, and stories during the one-year project. We were joined by the Fort Boise Garrison who added period color and authenticity to the day. We also had a great display of tools, provided by Rick Poplack, that helped everyone uderstand how construction was done in the late 19th century. Thank to all of them for helping us celebrate. The "Quarters for Quarters" program started after a group of school children who toured the VAMC campus with Preservation Idaho donated quarters so that we could try to save Building 4 on Officer's Row. Built in 1863, the building had served as a the Quartermaster's Building and Surgeon's home, as well as VAMC offices. More recently, it stood vacant for over 20 years while the roof and the building deteriorated and was in danger of falling to the wrecking ball. The VAMC campus is open to the public. While you can't enter the Surgeon's Quarters on your own, you can drive to Officer's Row and admire the beautiful buildings that are still standing; they tell the story of Boise's history, the history of the state of Idaho, and the proud history of our Veterans. Thanks to the VAMC Administration for partnering with Preservaiton Idaho. We are proud of the work we have done and grateful for all the support we received to make the project come to fruition.